Hours: 10:00-5:00 daily, except in the winter. 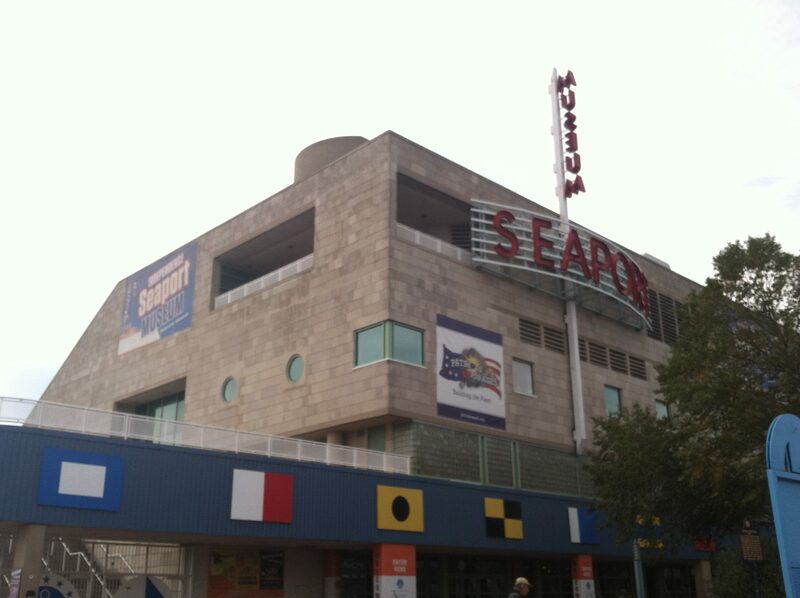 Located on the banks of the Delaware River, the Independence Seaport Museum is a highlight of any visit to Penn’s Landing, and Philadelphia as a whole. It explores the maritime history of Philadelphia, particularly along the Delaware River watershed. Upon entering, visitors are greeted by a model of the Ben Franklin Bridge. To the left are two of the permanent exhibits, Disasters on the Delaware, and Divers of the Deep. The former displays newspapers and artifacts from, as the name would infer, the many maritime disasters that have happened on the Delaware River. The latter has authentic diving equipment. On the second floor, Titanic Philadelphians tells about the RMS Titanic’s fateful voyage from the perspective of 40 Philadelphians who sailed on it. Visitors can view boats under construction at Workshop on the Water, on the first floor. The latest exhibit, Patriots and Pirates, chronicles the relation between pirates and the newly founded U.S Navy during the American Revolution. There is a replica of the Schooner Diligence, which is at the center of the exhibit. Model ships can be found throughout the museum, as well as paintings, prints, and artifacts. 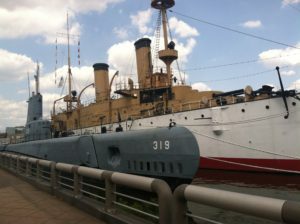 Perhaps the real highlight of the museum is the Submarine Becuna and USS Olympia. The Becuna was a WWII and Cold War submarine used against the Japanese Navy during WWII and for espionage during the Cold War. It is very tight on the inside, allowing minimal room to move around. The entrances themselves are also very small. The interior of the submarine contains rooms such as the engine room, where the machinery controlling it are. There are also the rooms in which midshipmen lived, such as the mess hall and sleeping rooms. The Olympia is much larger, and she is the only surviving Spanish American War vessel. She was a much more livable vessel, and also had quite formidable conditions for the captain and high ranking officers. She is famous for being the ship that carried the Unknown Soldier from World War I back to the United States. She was also Admiral Dewey’s flagship during the Spanish-American War. Visitors follow a guided path through the ship, which takes them to several parts of the ship, inside and out. On the inside, people can visit Officer’s Country, which includes the officer’s staterooms and mess hall, which have elaborate woodwork and fine furnishings. In the lowest deck, people can visit the engine room and the boiler room. The crew space is where the crew lived their daily lives, in a space filled with hammocks. On the upper deck, visitors can see the ship’s guns from the outside, as well as spectacular views of Penn’s Landing and the Camden Waterfront. Admission is $15 for adults, $10 for students, seniors, children, and military personnel. Admission to the museum also grants you admission to the Becuna and Olympia. The Olympia is in serious need of repair and may be dry-docked for repairs.